Drawing upon his unique background and perspective, Adam motivates audiences and provides tangible takeaways focused on enhancing the leadership skills and performance of each person in the room. Incorporating lessons learned from a career successfully bootstrapping businesses in three different industries; recruiting, hiring and managing hundreds of millennials; and interviewing and chronicling many of the country's most effective leaders, Adam prepares individuals across all stages of their journey for the next step personally and professionally. “Adam is an engaging, dynamic speaker that fuels positive energy into his audience. His insight on business success, overcoming obstacles, and finding true passion provided us with useful, tangible, inspiring materials to facilitate learning. Adam inspired me to remain committed to my professional goals as he shared his own journey with us. I would love to attend future presentations that Adam has to offer and would highly recommend him to those groups looking to take their members to the next level of performance, enthusiasm, and confidence." "Although Adam has years of experience in the business world, he is so humble and down to earth when he speaks. Adam is extremely approachable, and it feels as if he is speaking to close friends when he presents. He personally connects with each member of the audience, and he knows how to really listen, validate, and include everyone's input. Adam willingly shares his advice and is happy to help others succeed. He is not afraid to talk about the difficulties he had to face, personal and professional, proving that failure is a part of success. Adam is extremely relatable, and because of this, he is able to foster a unique sense of trust and understanding with his audience when he speaks." "Adam Mendler is one of the most unique public speakers I’ve had the pleasure of listening to! I’ve witnessed his stand-and-deliver style as well as when he uses visual aids. Whatever kind of talk he does, not only does he engage the audience with his charm, but he also makes the experience feel like a conversation more than delivering a ‘lecture.’ I can appreciate his ways of speaking because he doesn’t make himself sound like he is above everyone else, but that we all can learn something from one another. It’s rare to find a public speaker who is both humble and successful in his delivery." "Adam was a guest speaker at my university, and his presentation was terrific. He is an incredible speaker with a unique ability to powerfully engage with the audience. It feels like he has a secret sauce to deliver an important message directly into your mind." "Adam is an accomplished entrepreneur, tremendous public speaker and a GIVER! We had the pleasure of hosting Adam in our accelerator program. 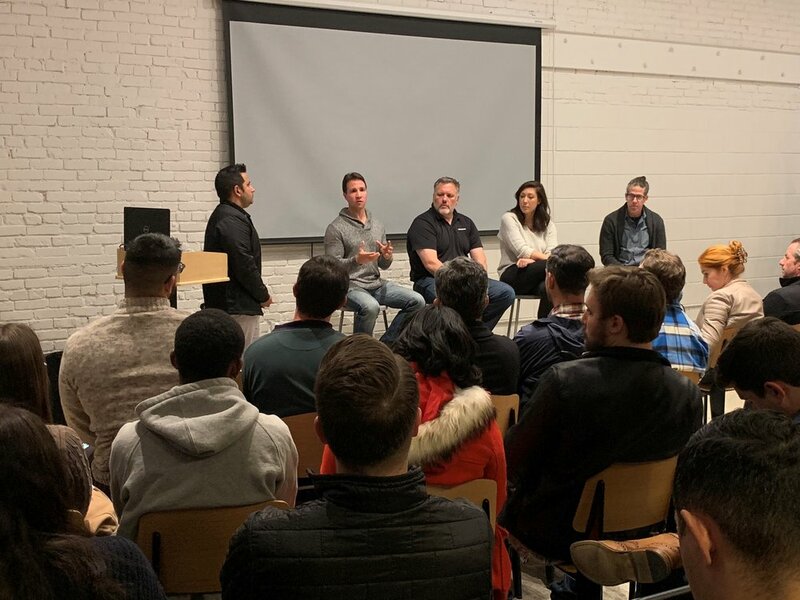 As a speaker, Adam was both engaging and insightful; his ability to communicate key lessons from his career as a founder of numerous ventures was extremely helpful for our companies in navigating the U.S. market and the Los Angeles ecosystem." "Adam is a very inspirational speaker. I still remember very clearly how he shared his experiences as he taught me and my colleagues about the importance of web advertising. Everyone loved him, as he is also very active and interactive during his speech. Adam is a motivational person that you can look up to." "Adam has been a fantastic speaker in my entrepreneurship courses at UCLA. He is engaging, entertaining, and connects with the students with a perfect mix of humor, insight, and authenticity to keep students involved while he details his entrepreneurial journey and provides keen insight into the real world of running a startup." "Adam is able to quickly engage his audience through personal stories, relatable goals and experiences, and a good sense of humor. With this, his topics and message are able to really reach his listeners and they are able to take away several worthwhile nuggets of wisdom." “We've had Adam Mendler speak to 50 students and to 150 students, and the reaction was always the same. The crowd loves his enthusiasm, his practical ideas about entrepreneurship and success, and his can-do attitude. His polished speaking style catches their interest, and the relatable content keeps them coming back for more. I highly recommend Adam as a speaker, and look forward to continuing to invite him back again and again.